The National Sports Collectors Convention is now in full swing, so be prepared to see a bunch of news and pics from the show on this blog. If you can't tell, I really want to be there. Unfortunately, that just wasn't in the cards. Anyway, Panini America just release pics of their VIP Party photographs that will be given out this coming Saturday. Only special guest of Panini (i.e. high dollar spending collectors) will have a chance for a "meet, greet and sign". 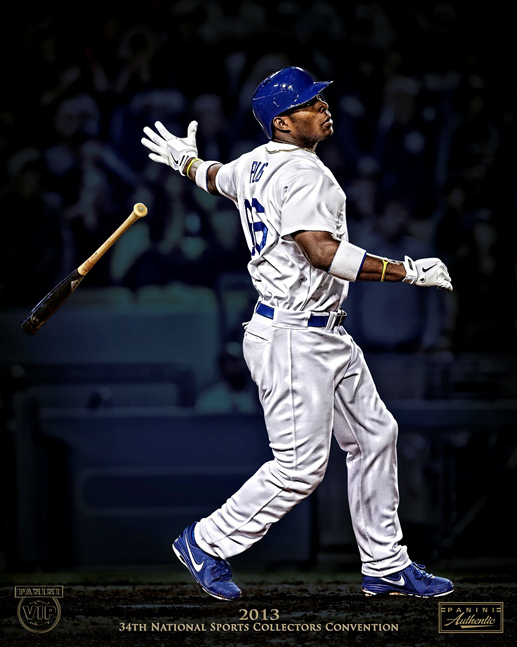 Check out the Yasiel Puig photograph above. Oh... to be super wealthy. 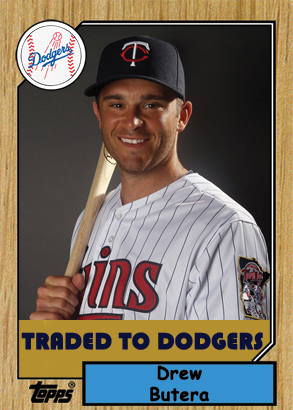 Welcome to the Blue, Drew Butera! The Dodgers made a minor trade today that involved a back-up catcher for cash (or a player to be named later). They picked up Drew Butera, who is the son of former Major League catcher Sal Butera, from the Twins. He will be sent to AAA- Albuquerque. This is just a depth move by the Dodgers. He is essentially the back-up to the back-up. So, if Tim Federowicz were to go down (or AJ Ellis) then Butera may find himself on the roster. Also, he is on twitter. You can follow him here: @drewbutera. Frankly, there really is nothing to see here. This is a "just in case" move for a guy who hasn't shown much of a "bat" in the majors. BTW, I made the above fantasy card of Drew using the 1987 Topps card design and a photo grabbed from Zimbio from press photo day (Elsa/Getty Images North America). The Los Angeles Dodgers today acquired catcher Drew Butera from the Minnesota Twins in exchange for a player to be named later or cash considerations and optioned him to Triple-A Albuquerque. Butera, who turns 30 on Aug. 9, has a .182 career batting average with five home runs and 41 RBI in 186 career big league games with the Twins from 2010-13 and has hit .217 with 24 home runs and 169 RBI in 485 games during seven minor league seasons. The 6-foot-1, 200-pounder appeared in two games with the Twins during a brief call-up from July 24-28, but has spent the majority of the 2013 campaign with Triple-A Rochester, batting .229 with two homers and 10 RBI in 26 games with the Red Wings. Butera, who was originally selected by the Mets in the fifth round of the 2005 First-Year Player Draft out of the University of Central Florida, is the son of former Major League catcher Sal Butera, who played in nine seasons with the Twins (1980-82, 1987), Tigers (1983), Expos (1984-85), Reds (1986-87) and Blue Jays (1988). The Los Angeles Dodgers today recalled outfielder/first baseman Scott Van Slyke from Triple-A Albuquerque and optioned infielder/outfielder Elian Herrera to Triple-A. Ain't this just darling? 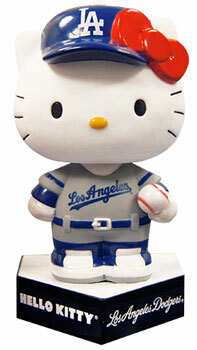 Here is a sneak peek at the Hello Kitty bobblehead that will be given out at the Monday, September 9th ballgame against the Diamondbacks. 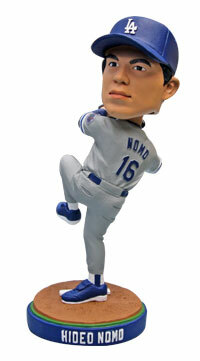 Below is an early pic of the Hideo Nomo bobblehead that will be give out on Saturday, August 10th against the Rays. For the sports collector this week is either the greatest time of year, or the worst. Which one you are depends entirely on whether you have the opportunity to go to the National Sports Collectors Convention. Unfortunately for me, I'm the latter. It's is being held in the Chicago area, so I have to live through the eyes (or twitter pics, if you will) of others. The show begins today, and there are already some photos online for collectors to gawk over. Check some of them out below. Who doesn't want to make their own Baseball card? There are cards, autograph signers and artwork to fill the fancy of any collector. How about some vintage wax. Check out that box of VIP promo cards! This is a brand new Topps product and it's very different from their normal fare. 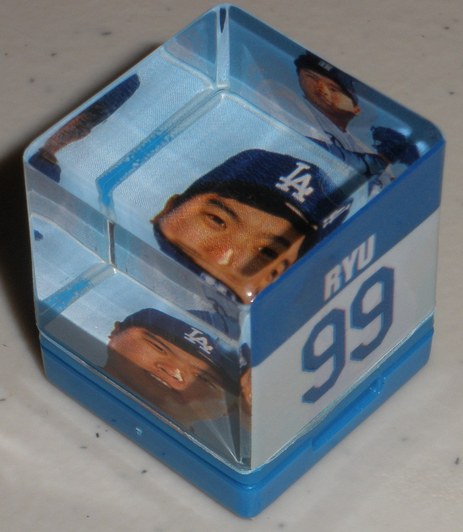 They just released their Qubi Baseball Stampers, and as you can imagine it's geared for the youthful and young at heart. 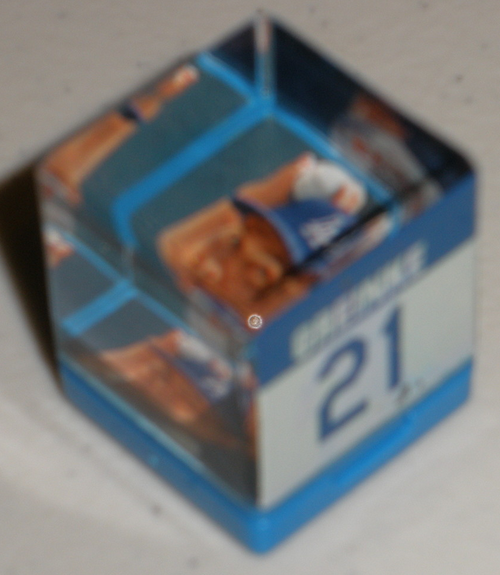 They are little cubes with player photos on the inside and a rubber stamp on the outside for you to use at your will. Most of the stamps available appear to be copies of the players signature, while others are a player portrait or team logo. 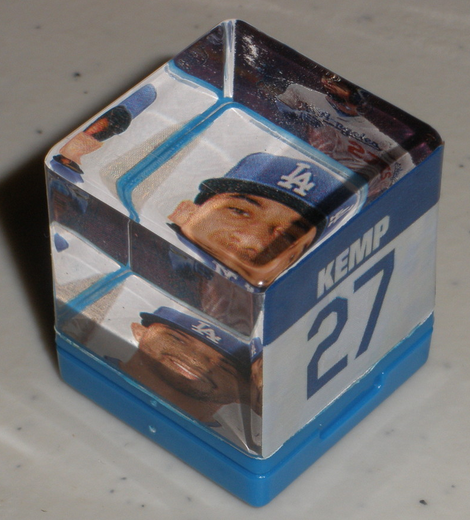 Five Dodgers are represented and they all feature just the players autograph on the stamper. See them below. BTW, there may be scarce variations available, but additional details have not been released. Two legends in one photo. Pic above via Jon SooHoo/LA Dodgers 2013. See more pics from Jon right here. I thought I would provide this quick notice that the Dodgers will be showing the movie "The Sandlot" after the ballgame on Sunday, September 1st. More information is available here. "Q & A: Magic Johnson happy to be a role player with Dodgers," via Mark Medina at the Daily News. Q: Has your role with the Dodgers evolved this season compared to last year? Johnson: No. I'm enjoying my role. I called every player before the season and talked to them on how we didn't have a leader. I talked to (Clayton) Kershaw, (Adrian) Gonzalez and A.J. Ellis recently and I said, 'You guys have really come on as the leaders of this team.' When I recap last season, we didn't have a leader. That hurt us. My role is to look and see what's missing and try to fill the blanks. Wherever they need me to fit in, that's what I'll do. I've tried to teach our players about having a winning mentality. 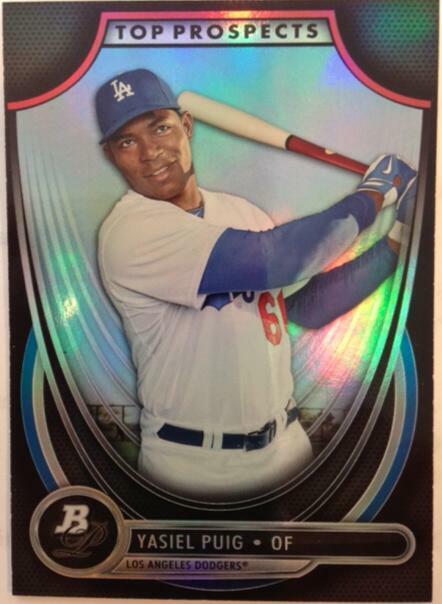 On twitter Bowman Scout (a Topps twitter account) shared a early pic of the Yasiel Puig Bowman Platinum Top Prospect card. See it on the right. BTW, this product officially went live today. 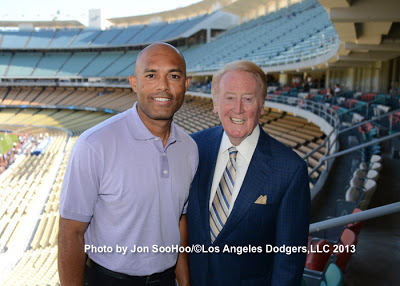 Roberto at Vin Scully is My Homeboy has the story on an apparent "bait & switch" at Dodger Stadium. Kids were suppose to get some fancy Dodger sunglasses, but instead received cheap knock-offs. FOR SHAME! "Dodgers weighing options for Fife's return," via Austin Laymance at MLB.com. "He's making another start, we're just not sure where," Dodgers manager Don Mattingly said on Tuesday. Here's a minor league update. Phil Gurnee at True Blue LA writes, "Dodgers minor league report July 30: Matt Magill shines in 2-0 victory". 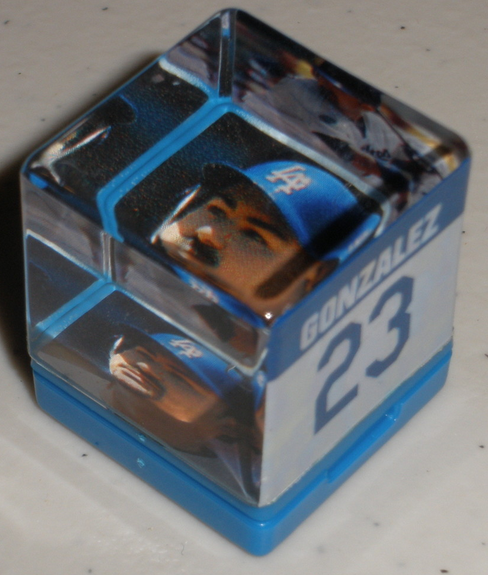 "Daily Distractions: How Ned Colletti plans to upgrade the Dodgers’ bench." Via JP Hoornstra at Inside the Dodgers. 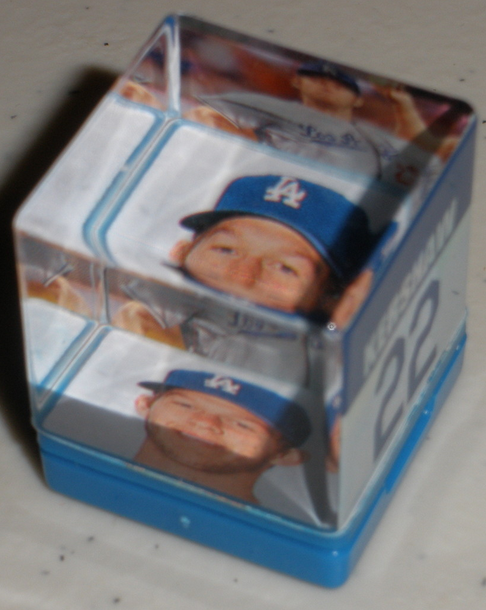 "Is the Dodgers' Clayton Kershaw baseball's most popular pitcher?" Via Steve Dilbeck of the LA Times. Micheal Kay sits down with Vin Scully and reminisces about the legendary broadcaster's career with the Dodgers.